The word for today is earthly. 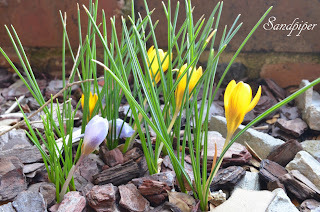 A few days ago I posted an image of crocuses blooming to expand on the word live. 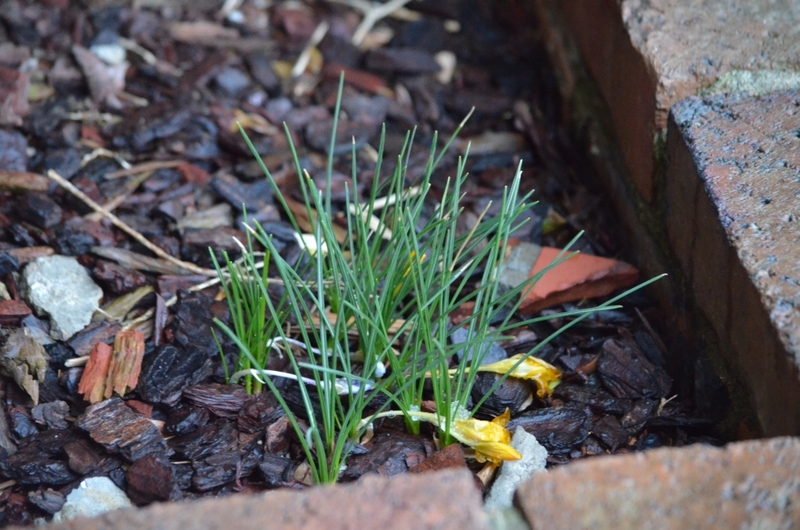 This morning it was snowing, and the crocus flowers were dead. This is the way of mortality -- it is earthly. We are dust, and yet we have the hope of immortal life, resurrected life, because of God. The word for today is hear. This is our dog, Molly. She hears everything, even though she is 10 years old. Nothing gets past her listening ears except that which she does not want to hear. 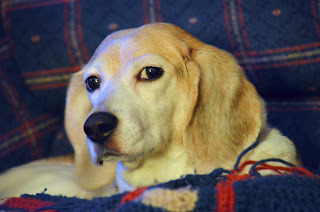 She looks very somber in this image -- I woke her up to take the picture -- but she is, in fact, a joyful, happy dog. She is devoted to our family, and she listens for every hint of movement or change. If we leave the room, she follows. Never tell me that she doesn't understand English -- she does. I think her acute listening skill is a sign of her devotion. Is it a sign of our devotion? Do we listen to each other? Do we listen to God? What is it that we choose to hear? The word for today is lift. 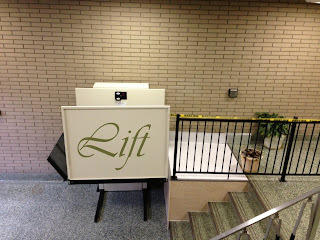 This is the new lift in the church building where I work. 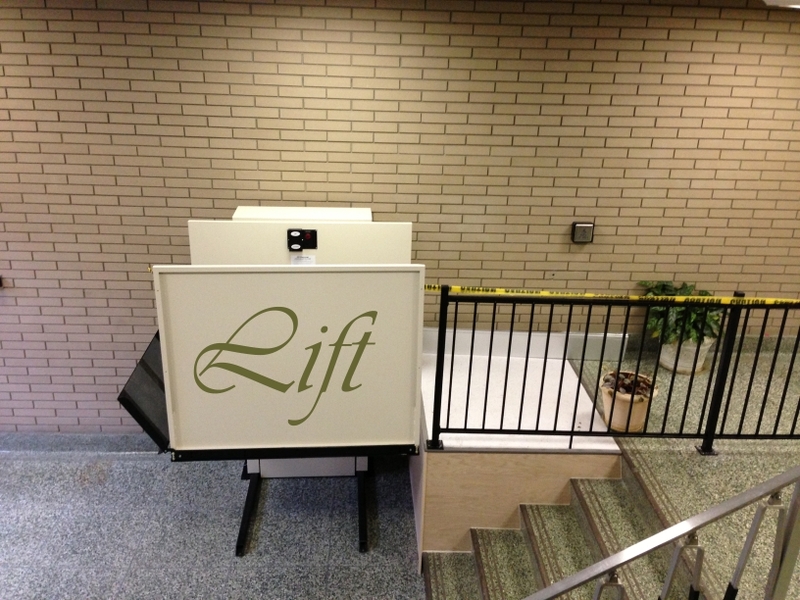 It's a mechanical way to help people with access into the building. What other ways are we called to give God's children a lift? 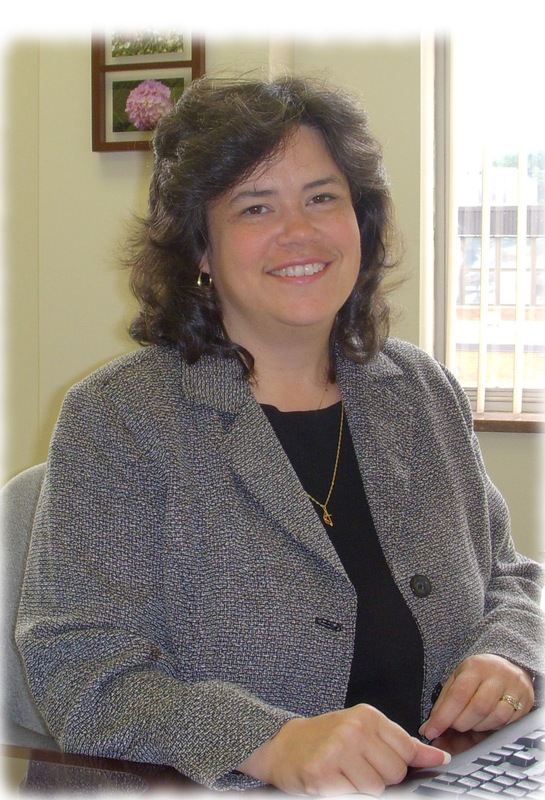 How can we increase accessbilitiy to God? The word for today is cover. 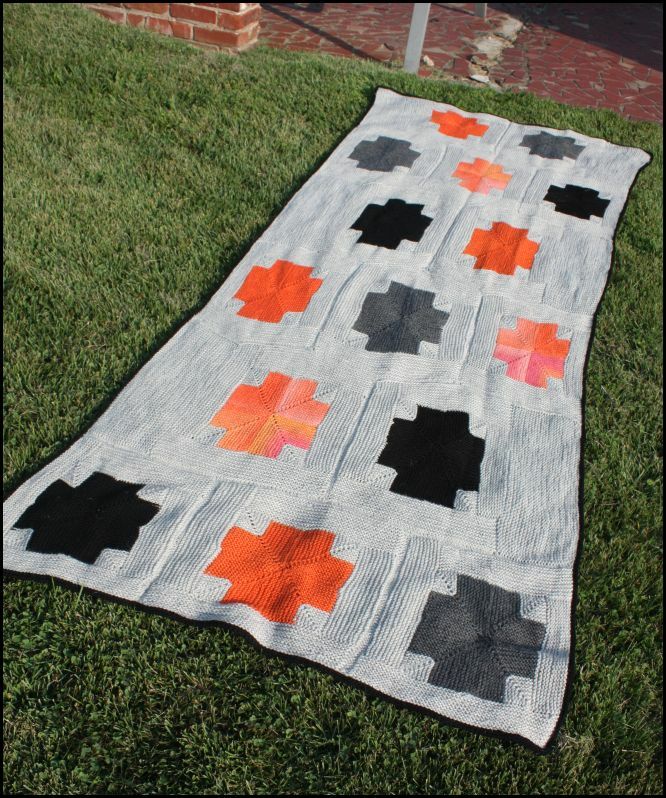 This is an image of a blanket I knit for our older son when he was headed off to college. It turned out longer than I planned -- 8 feet long -- but he's 6 foot tall, so it works. It felt like I was covering him with love as he took the next step in his life. Cover. We are covered in love, too. The word for today is vision. The hymn Be Thou My Vision is my favorite hymn. 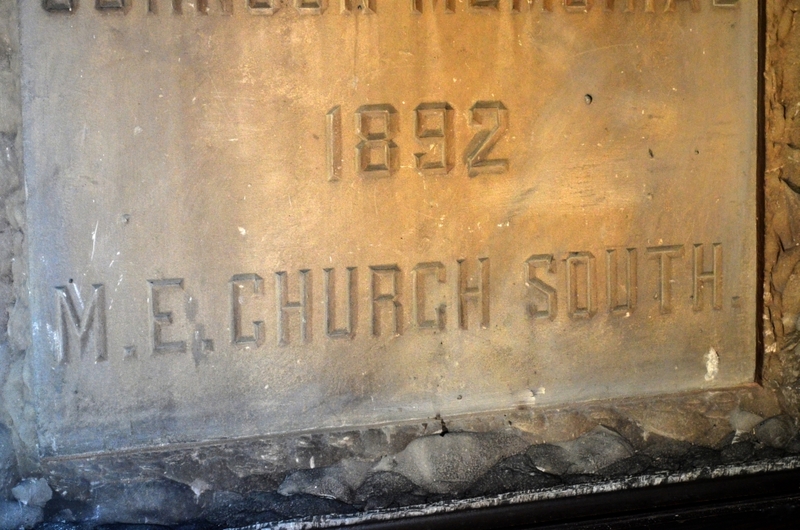 As I was looking at the picture I took of the hymnal, I noticed my reflection in the cross. I think that says something. The word today is spirit. 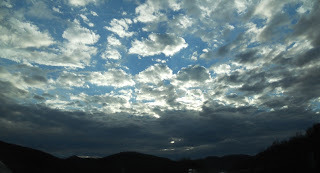 There is something about the play of light and sky that reminds me of God. That says "God" to me. Maybe it is the use of the metaphor of God is light in the Bible. Maybe it is the connection of the words spirit and wind and breath in Hebrew. There are so many pictures I could have posted, but this is the one that came to mind this morning. It is of my mother-in-law, Judy, with our babies. 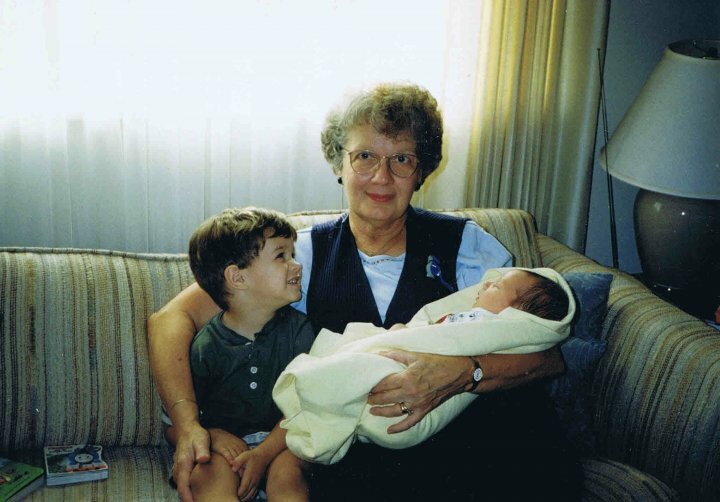 I think the look on Grant's face is love. Captured in a picture. On of the things that I think is interesting is that yesterday's image, posted in response to the word evil could have been the picture posted today, in response to the word love. This is the crucifix at a nearby retreat center in Charleston. When I thought of the word evil, many images came to mind. I settled on the act of crucifixion. 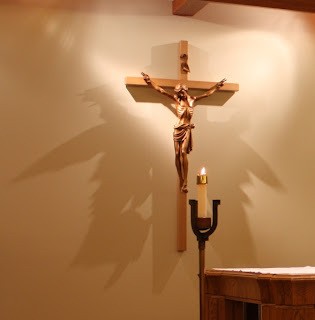 What has always struck me about this particular crucifix, though, are the shadows. Can you see them? With some study, you might be able to imagine that they are angels, holding up Christ. In the presence of evil, Christ was not alone. In the presence of evil, we are not alone. As we floated along, the tour guide pointed out to us some very old drawings on the rock face. None of us on the tour were interested because above us, in the tree, was a bald eagle. It was magnificent, and it was the first time I had seen one in the wild. Today's word is wonder. 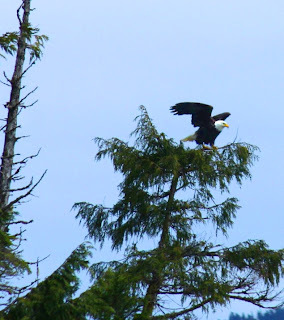 I watched that eagle with wonder at how beautiful it was, and what an amazing creature it was. Look at the world with wonder and be amazed. The word for today is world. How do you take a picture of the world? This was a case of the hunt for the word in the world opening my eyes to the world around me. 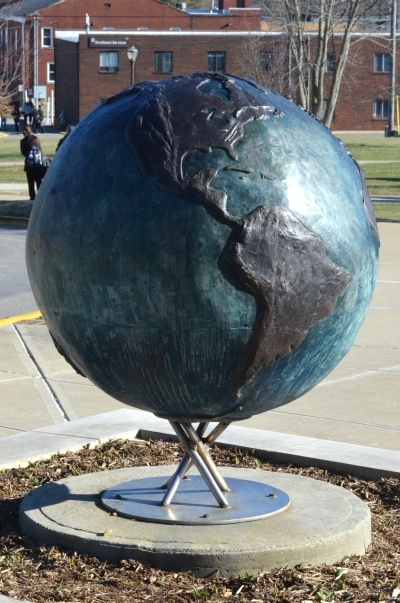 This globe is a statue on the campus us Morehead State University in Kentucky. Josh had just finished his band concert and Mom and I were walking across campus to meet Steve and the car. There next to the sidewalk was the world. It's maybe 10 feet tall -- a globe, right there on campus. Would I have seen it if my eyes hadn't been open to look? I don't know. I doubt I would have paid much attention. Open your eyes. You might miss the world as it goes by. 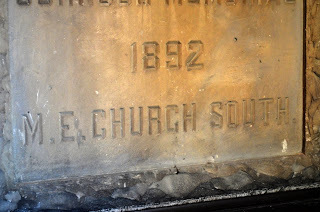 The Rethink Church Lenten Photo-A-Day word today is settle. I spent much of yesterday and today trying to figure out how to capture the word settle in an image. A handshake? A line drawn in the sand? Sand settling to the bottom of a glass of water. During Josh's band concert today I was watching the conductor. 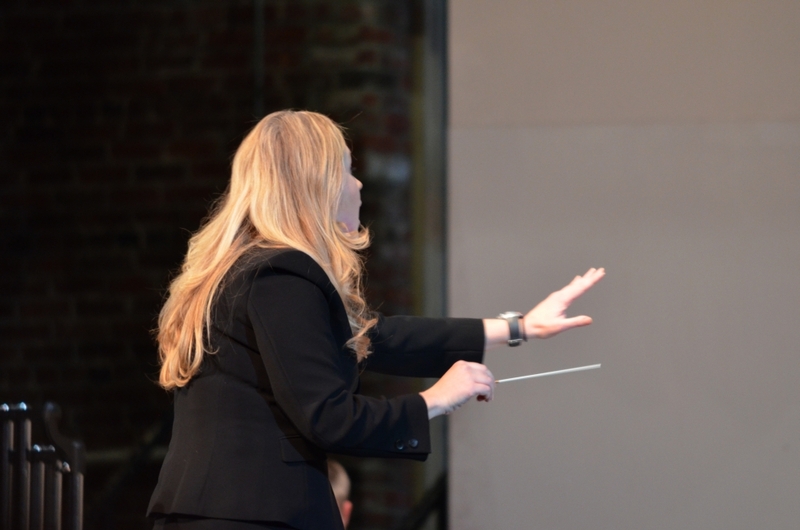 She used her hands to control the rhythm and the volume of the band. I could almost hear her telling the band to settle -- to calm -- to quiet themselves. That was my picture. God settles our hearts and minds sometimes, if we will let him. Be still, and know that I am God. Settle. The word for today is see. The moon the other night was just a sliver of light. 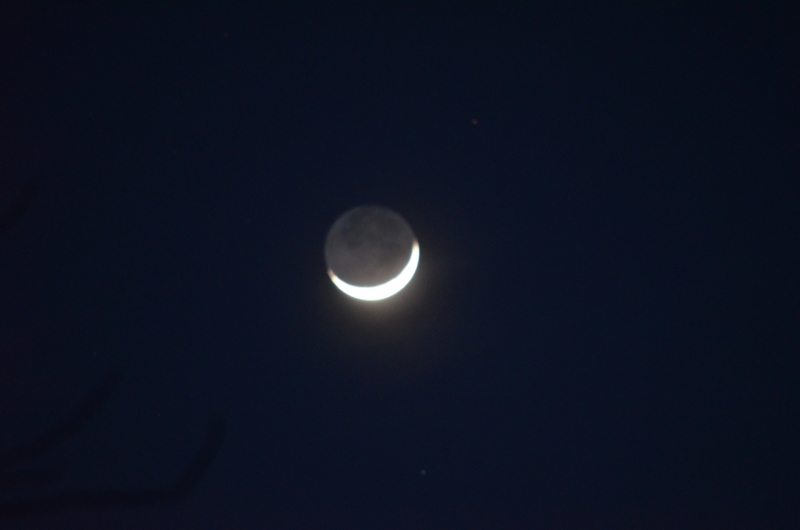 I am always surprised when I can see the part of the moon that isn't lighted by the sun -- the dark side. It isn't really dark, it's just harder to see, but you can see it. Sometimes God is hard to see. To know. To hear. Yesterday, I felt the nearer presence of God through his actions in the people around me. Reflected light. Like the bright side of the moon. Other times, he's harder to see, but he is visible, and he is there, even when the moon is the darkest. The word today is return. 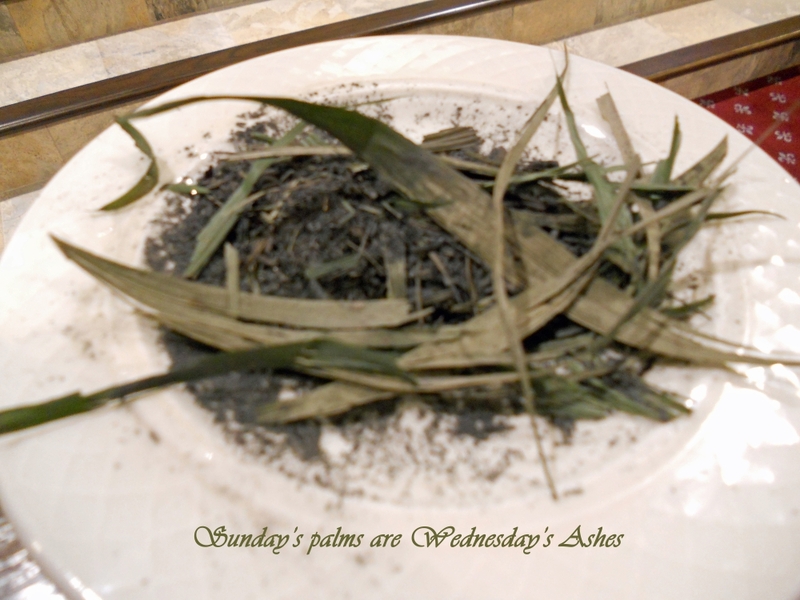 This is an image of the palms used on Palm Sunday in our church and the ashes used last night for Ash Wednesday. Sunday's palms are Wednesday's ashes. Our pride, our arroagance, our sin is turned to ash. On Ash Wednesday, we endeavor to return to God, just as the palsm are returned to the dust and ash. Perhaps it is in the reminder of our human-ness that we are able to return to the divine. I was browsing through Facebook and found this, posted by another United Methodist in our Annual Conference. I explored it a little bit, and thought I would give it a shot. My posts have been very image-deficient for a while, which means I'm not focusing on taking pictures. Perhaps these daily prompts will help. Each day in the Lenten Photo a Day "challenge" has a word associated with it, to prompt the image. Today's is "Who am I?" When a mother walks down the street with a toddler, she holds out her hand and the child grasps it. It is a connection. I imagine the child knows the safety and security of holding on -- the balance it provides and the protection offered. The hand is the way the child connects to the mother for those moments. The mother is much more than the hand, but the hand offered and taken is the way the child grasps the mother. God is beyond our understanding, and yet God provides us with ways to hold on -- to grasp him. I know and believe that God is a triune God. That God is creator, son and holy spirit -- all three in one, but I can't understand it. God knows I can't understand it. God gives me ways to grasp a part of himself. Images of parts of what God is like -- God the father, Jesus, the son. The presence of the Holy spirit. These are my handholds. These are ways I can relate, even though I know all are one, sometimes, the Spirit is the handhold I need to grasp God. I don't have to understand, I just have to believe. 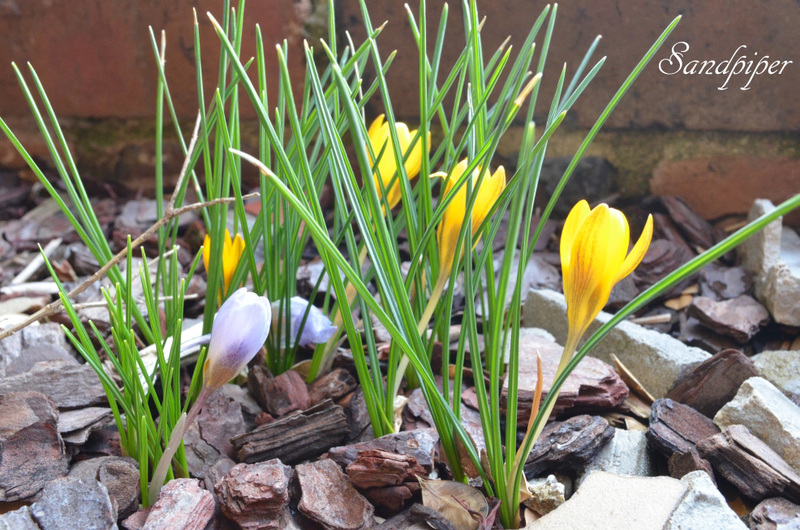 What does it mean to act with boldness? Sometimes I hear people in Sunday school shy away from telling others about their faith because they are worried about reactions -- about offending someone -- about being judged. Before you judge them, just by reading this, know that they are kind, Christian people. I spend my days in a job where it surprises no one that I talk about God, and yet I can understand people's worries. I at times experience them. Being bold for God isn't easy, and it isn't simple. That doesn't mean it isn't necessary or expected of us, but it's not as easy as those who are gifted to do it might believe. Otherwise, it wouldn't be "bold." Have you ever thought of being bold in listening? One of the devotions I read this morning spoke about bold listening. Are you bold in your listening? Do you hear what people are telling you? I often say my husband has a face that encourages people to talk to him. He has a great face, but that's probably not why people tell him their stories. He's a bold listener. Being a bold listener means you open your mind to hear what another person is saying. To open your mind to understand what is being told to you. It's a kind of vulnerability -- opening up oneself to the idea that someone else could change your mind -- or change your actions. Opening up to the idea that someone else's story might prompt you into a response that could help the other person. It is opening up oneself to loving that other person. Be bold in your words. Be bold in your listening. You have a great hope, so you can act with boldness. You are a God of holiness. We are a people who rarely see or experience holiness. We are a people in need of you. Open our eyes so that we can see your holiness all around us. Open our hearts so that we can share the holy love you have placed in our hearts. Open our ears so that the sound of your breath fills our spirits and ignites our words. Open our minds so that we can know your holy connection with everyone. Open our mouths so that your holy message spills forth. Open our lives so that your holiness can fill us, transforming us from who we are to the holy people you have created us to be. You are holy. We are not unless you change us. Hear our call. In your son’s name, we are bold enough to pray. Amen. When I was in high school, my youth group went on a two week trip across the country. Each evening the bus stopped at a different church, we performed our "tour" show for the congregation, spent the night with members of the congregation and then went to the next town the next day. In El Paso, Texas we spent a week leading vacation bible schools for children. It was truly a mountaintop experience that still influences my life today. I read a devotional yesterday that compared mountaintop experiences to mountain climbing. One cannot arrive on top of the mountain without climbing it, and climbing the mountain is hard work. That trip in high school took months and months to plan. 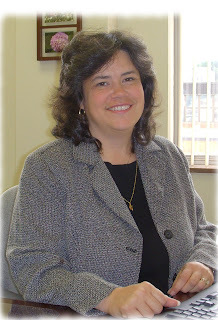 We had rehearsals, fund raisers, meetings to plan VBS lessons. We drove for hour and hours, hauled equipment, ran cords, set up lights. It was all hard work. But without the hard work, we never would have made it up the mountain. To see the transfiguration of Jesus, the disciples had to climb the mountain. We talk alot about how they left the mountain and went to where the work was to be done - back in the valley. Do we ever consider the work that had to be done to get to the top of the mountain? If we want to see Jesus face to face, if we want to experience the mountaintop, maybe we need to get busy working to get there -- study, service, prayer. One of the lectionary readings for this week is Luke 4:21-30. Jesus is in his hometown, and he is not accepted. As I was reading a devotional about that passage, I read the word calcified. When something is calcified, it becomes hard and brittle. Are we calcified? Are we so set in our ways that we would throw Jesus off a cliff before we would allow his Word to soften our hearts and souls? In what ways are we calcified?